Taking inspiration from top food trends and packed full of flavour, these recipes show that keeping your gut healthy ned not be bland or boring. 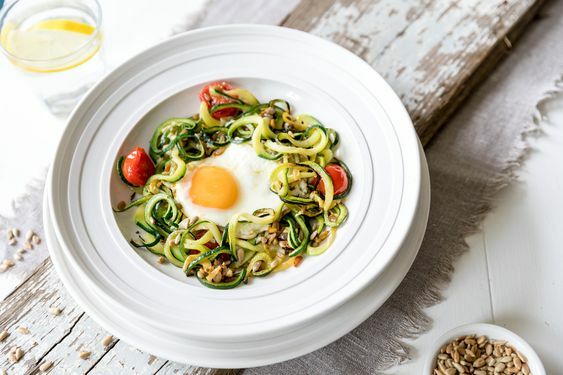 From Middle Eastern inspired Courgette Shakshuka to low fat cheesecake alternative Frozen berry Yoghurt Cake, gluten free Socca Pizza and a Full English Vegan Fry Up, these recipes are both full of gut-friendly dietary fibre, prebiotics and polyphenols and in addition delicious. Why not show your gut the love it deserves and give these recipes a go? Be sure to visit www.loveyourgut.com for more information on good gut health and extra recipes too. 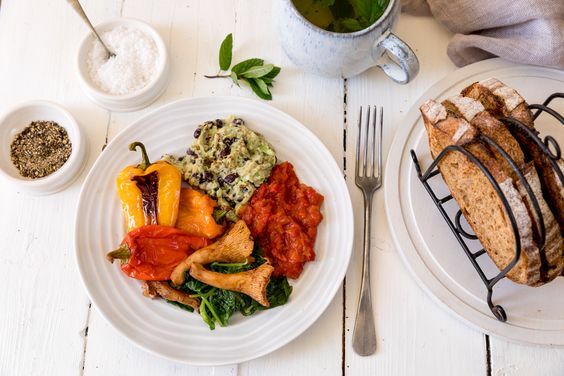 This fabulous vegan fry up is tasty and filling and contains a welah of gut-friendly ingredients. Black beans are a great source of dietary fibre which helps to keep the gastrointestinal trect moving and also contain galaco-oligosaccharides, which act like a fertiliser in the gut and provide material for beneficial gut micro-organisms to feast on. Ginger is a soothing spice and gentle on the gut. 1) Preheat the oven to 200 degrees/ Gas mark 6. Place the peppers on a roasting tray and drizzle over a little of the olive oil. Roast for 20 minutes or until the skins begin to blister and turn brown. Remove from the oven. 2) To make the ketchup. Drizzle a little more of the olive oil in a pan, add the chopped shallot and sweat until soft. Add the grated ginger and tamarind paste to the pan and cook gently for 2 minutes before adding the chopped tomatoes and palm suar. Simmer for 20 minutes until the sauce is thick. Season to taste with salt and pepper. 3) While the ketchup cooks mak he avocado mash. Simply mix the mashed avocado with the black beans, lemon, garlic and cumin to form a rough paste. 4) Place the mushroom sin another pan wih a drizzle of olive oil, Cook over a moderate heat for 5 minutes or until the mushrooms are sodt. Move the mushrooms to one side of the pan, add the spinach and cook until it wilts. 5) Serve the mushrooms, spinach, avocado and clack bean mash with the tomato and tamarind ketchup. This would be lovely served with fresh toast. Note: Palm sugar adds caramel flavour as well as sweetness to a dish. It is great for balancing the acidity of dished containing tamarind, lemon or lime. Variation: This dish would be great topped with a poached egg for vegetarians and a rasher or two of bacon for meat eaters. 2) Make four little wells in the courgette mixture. Break the eggs into a cup, one at a time, and drop them carefully into the wells. Cover with a lid if you have one and cook for five minutes or until the whites are just set and the yolks are still runny. 3) Serve sprinkled with a little chopped mint or parsley. 1) To make the bases. Put the chickpea flour, grated cheese and salt in a large bowl and slowly whisk in the olive oil and enough of the water to form a thick pouring batter. Leave to rest for half an hour. 2) For the caramelised onion, put the onion, a drizzle of oil, sugar and salt in a large pan and cook over a medium heat for 7 minutes or until the onions are soft and beginning to brown. Remove from the heat and stir in the crushed garlic. Transfer to a bowl and set aside. 3) To cook the socca pizzas. Heat a drizzle of oil in the frying pan and pour in enough batter to cover a 20cm (8 inch) non-stick frying pan. Fry gently on a medium heat for 5 minutes and then flip over and cook for five minute more. Transfer the socca pizza to a baking sheet and repeat with the remaining batter to make four bases. 4) Turn the oven on to 180oC/Gas mark 4. 5) Meanwhile cook the broccoli in a pan of boiling water for 3 minutes and drain. It will still be a firm. 6) To assemble the pizzas. 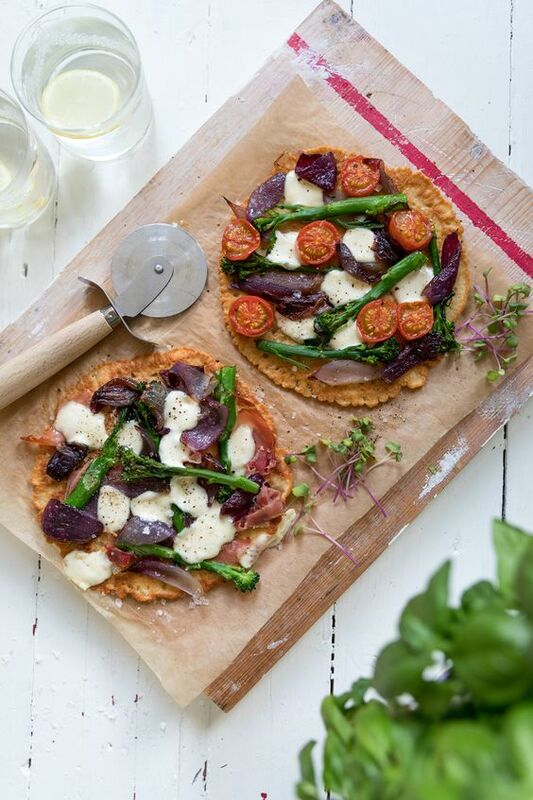 Dollop each base with caramelised onions, broccoli, prosciutto, cherry tomatoes and mozzarella pearls. Place in the hot oven for 5-10 minutes until the cheese is melted. Serve sprinkled with torn basil leaves. 1) Preheat the oven to 180oC/Gas mark 4. Place the sunflower seeds on a baking sheet in the oven for 5 minutes or until the seeds begin to brown. Remove the seeds from the oven and pulse in a food processor for a few seconds so they roughly chopped. Add the dates, coconut oil and process until the mixture resembles a thick paste. Press the date and seed mixture into the base of a 20cm (8in) spring form cake tin. 2) Purée the strawberries with the lime juice and honey in a food processor and add the Greek yogurt. Mix well and pour onto the date and seed crust in the cake tin. Place in the freezer for 2-3 hours to freeze. Remove a few minutes before serving. 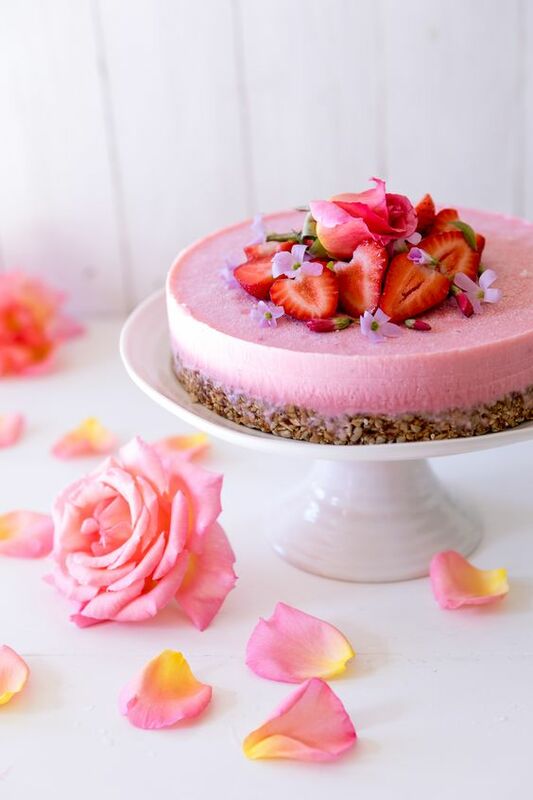 Decorate the top of the cake with berries and edible flowers. Variation: For a vegan version use a began cream cheese. Raspberries, blueberries and blackberries can all be used instead of strawberries. What do you think of these recipes? Do you have any of your own to share?